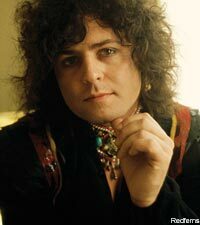 Bolan, born Mark Feld, was a devoted boyhood fan of Chuck Berry and rockabilly stars such as Eddie Cochran. After changing his name, he began performing as a mystical folkie, releasing his first single, ‘The Wizard,’ in 1965. With a legendary drug enthusiast named Steve Peregrin Took, who borrowed his own stage name from ‘The Lord of the Rings,’ Bolan formed the original Tyrannosaurus Rex. He quickly grew tired of his partner’s appetites; stories suggest that a bad trip from a spiked punch bowl hastened Bolan’s decision to toss his co-founder out of the band. With a distinctive electric-boogie sound and a flamboyant stage appearance including feather boas and top hats, Bolan’s band was the toast of London in the waning hippie years. Good friends with fellow glam icon David Bowie, his band played supersessions with Ringo Starr and Elton John. The T. Rex legacy was undoubtedly star-crossed. After a decade of misbehavior, original member Steve Took choked on a cocktail cherry in 1980. The following year bassist Steve Currie died in a car crash in Portugal. Part of Bolan’s legacy, meanwhile, is flesh and blood: Rolan Bolan, his son with Jones, has performed periodically in the 2000s. He was 2 years old when his father died.